The Teerathgarh Falls is a block type waterfall on the Kanger River. The water plunges 91 metres (299 ft) in a single drop. 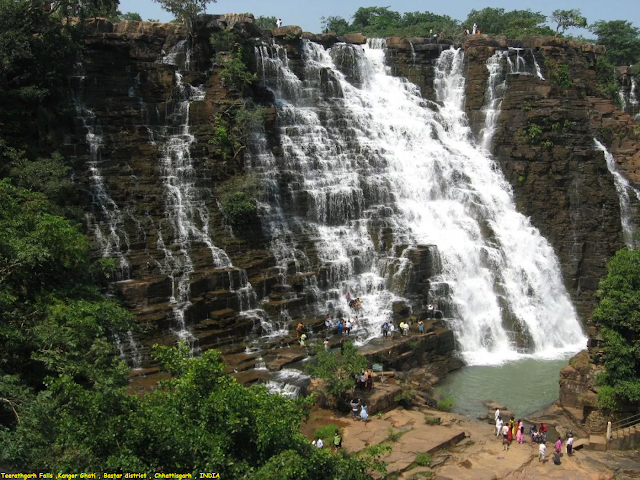 It is located at a distance of 35 kilometres (22 mi) south-west of Jagdalpur. One can approach the falls from Darbha, near state highway that connects Jagdalpur to Sukma. One has to take a jeep at Darbha junction to visit Teerathgarh and Kutumsar. Kutumsar Caves and Kailash Gufa are nearby attractions. It is in Kanger Ghati National Park. Water cascading from the beautiful hills surrounding the falls provides splendid views. Splashing streams of water come down at an incredible speed from a height on the river Mugabahar, which originates in a lake not very far away from this point. The area surrounding the fall features lush-green forests that enhance the beauty of the falls.